Class-C amplifiers conduct less than 50% of the input signal and the distortion at the output is high, but high efficiencies (up to 90%) are possible. The usual application for class-C amplifiers is in RF transmitters operating at a single fixed carrier frequency, where the distortion is controlled by a tuned load on the amplifier. 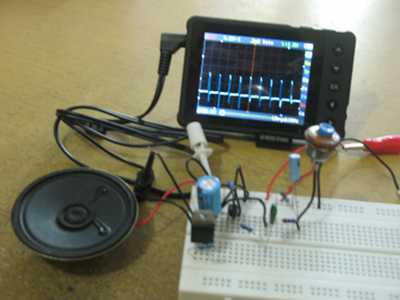 This amplifier of this class can be implemented as very simple circuit, and even simpler in our specific audio application: to amplify audio frequency square wave signal. See the schematic diagram of the circuit in Figure 2. The circuit needs only three components: one transistor, one resistor, and one decoupling capacitor. When the signal at the base getting higher than 0.6V, the transistor TR3 begin to conduct, pull the diaphragm of the loudspeaker. On the other cycle, if the voltage at the base going under 0V (going to negative), the transistor will simply cut-off, releasing the loudspeaker diaphragm to its normal depletion. We can say that this amplifier is class-c because there will be inactive region between zero and 0.6V, a small part of the positive cycle, when the amplifier don’t produce any response. You can see how the circuit works and produce the sound when it assembled and get powered in our Youtube video channel. There you can see the signal in the oscilloscope has small negative spike, which come from loudspeaker’s back electromotive force when the current is abruptly stopped by the transistor. Check it out!